Is Chamisa's Party Too Broke to Pay for Ads? 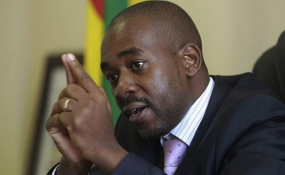 MDC Alliance presidential candidate Nelson Chamisa yesterday warned President Emmerson Mnangagwa's government against manipulating the July 30 elections, saying his supporters will not accept any rigged poll. Chamisa told a bumper crowd at his 61st rally at Mutare's Sakubva Stadium that the Zanu PF government was taking Zimbabweans for granted by allegedly trying to manipulate the electoral process in favour of the ruling party. Yesterday's rally was clearly one of the largest Chamisa has pulled so far with Sakubva Stadium packed to the rafters. "I want to warn Mnangagwa who might assume that all Zimbabweans are his people," he said. "They are playing with fire. "He should know that youth in the country don't tolerate any nonsense and I am going to lead them. "We are going to resist any attempt to rig the election. "But we won't boycott elections. Winners don't quit but Zanu PF might quit because they know that they might lose the upcoming elections." Chamisa on Wednesday led a massive demonstration against the Zimbabwe Electoral Commission (ZEC), which the MDC Alliance accuses of flouting the law in the printing and design of the ballot papers. The coalition of opposition parties was particularly peeved by Zec's alleged refusal to allow the MDC Alliance to inspect the printing of ballot papers. Zec's decision to produce a two-column ballot paper for the presidential election has also been criticised by the MDC Alliance, which says it is meant to give Mnangagwa undue prominence. One of the MDC Alliance leaders, Tendai Biti, told the same rally that he was not afraid of being arrested and would announce the July 30 election results ahead of Zec if they detected any attempts to manipulate the outcome. "I want to warn Mnangagwa that we are not going to allow an election with a gap," he said. "In 2008 I was arrested when I announced the results and I am going to announce the election results [again] on August 1. "They have a law that will see anyone who would have announced results being arrested." Biti said the big crowd at Sakubva Stadium yesterday showed that the MDC Alliance had an upper hand in the election race. "I am happy with the crowd that has attended this Sakubva rally, this is a strong statement that people no longer want Zanu PF," he said. "This has been going on everywhere we have addressed our rallies. We are tired of corruption. We are tired of intimidation. "We are left with only 16 days and I am happy that the dictator's campaign is crumbling." Meanwhile, Chamisa on Friday took a dig at Mnangagwa saying he was being overshadowed by Vice-President Constantino Chiwenga in the presidential campaign. "Now I don't know who wants to be the president between Mnangagwa and Constantino Chiwenga," the opposition leader told a rally in Mutasa Central. "I don't know who I am competing with in this election. Now let me lead this country as I have never killed anyone. I have never stolen anything from anyone." He ruled out a presidential run-off election, saying he was confident of beating Mnangagwa in the first round. "There is no run-off in the upcoming elections, but there is going to be a run-over," Chamisa charged. "Mnangagwa is finished; he is not going to win the election. Mnangagwa is on his way out and someone young is going to rule this country." Chamisa said the opposition had lost confidence in Zec and they wanted bodies such as the African Union and Sadc to intervene. "When I return to Harare, I want to make sure that Zec is stopped from supervising the elections. We need a proper referee since we have failed to agree with Zec," he said. "We demonstrated in Harare over the electoral reforms and the demonstration was well attended. "Some people wanted to march to Emmerson Mnangagwa's house [State House], but I said no. By demonstrating, we are showing people that we are a peace-loving party." Chamisa and Mnangagwa are seen as the front-runners in the presidential election race that has 23 candidates. Is Time Running Out for Electoral Body?